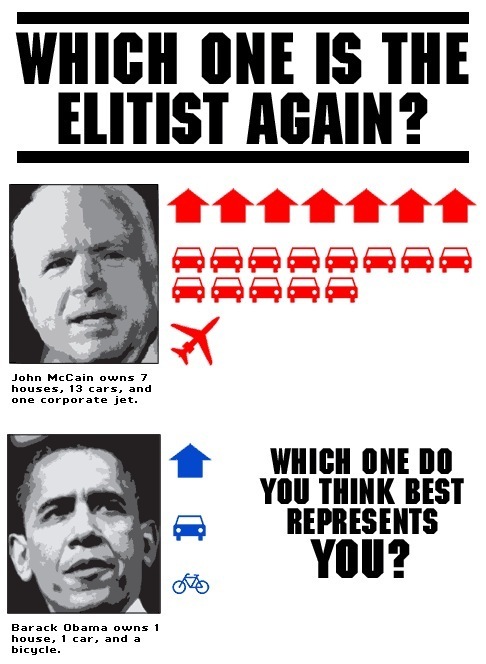 I like this anti-McCain impromptu jpeg below, but then again I am not exactly the target audience. Might the cult of material aspiration in the States blunt what seems like an obvious message to the likes of me? Given that folk buy into that attitude elsewhere, at an emotional level, might they not do so in an election as well? The test would be: how did Diddy's shout out to his brothers and sisters in Saudi Arabia for cheap oil for his private jet go down? This page was published on September 23, 2008 8:20 AM. Motivated Greens. was the previous entry in this blog. Second class response. is the next entry in this blog.